Sinhala Buddhists look up Jaya Sri Maha Bodhi as if it were a living being as if it were the Buddha himself. Thus all the rites and rituals, festivals and ceremonies that are performed at the Bodhi tree resemble those that are performed for the Buddha himself if he were alive. These rites and rituals are of two kinds: those that are performed daily and those that are performed annually at different times of the year. Daily rites and rituals include the offering of food and drinks to the Buddha Image at the shrine room at the foot of the Bodhi Tree. There are four main festivals are performed in honor of the Jaya Sri Maha Bodhi with great significance. The festival of the Duruthu Mangalle falls on the full moon day of Duruthu (January). It is called the Festival of the New Rice because the first portion of the new rice collected at the harvest is offered to the Bodhi tree on this day. The aim of this festival is to confer blessings upon the pious by chanting pirith and offering milk rice both at the Bodhi tree and the Ruvanvaeliseya. The festival of the Parana Avurudu Mangalle is held before one week prior to Sinhala New Year. The scheduled date for this function declared by the Chief monk will be informed to the (Kapumahaththuru) in advance. On the eve of the scheduled date monks who represent Atamasthana and Kapumahaththuru headed by Aramasthanadhipathi gathered to sacred bodhi tree and offering Gilanpasa, flowers, incense accompaniment of drums to the Jaya Sri Maha Bodhi. The monks chanting pirith and finally Devapuja is offered to Gods headed by Kaludevatabandara the deity supposed to protect the Jaya Sri Maha Bodhi. 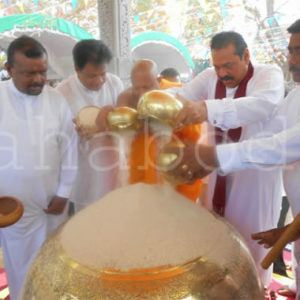 Finally they conclude the function doing the same rituals at Ruwanweliseya. The Festival of the New Year is held at the turn of the Sinhala New Year that begins in the month of Bak. The Sacred Bath is also on an auspicious day after the dawn of the New Year. 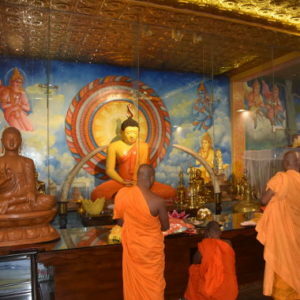 A ritual bath is conducted in the Shrine Room where the Buddha Image is anointed with water mixed with herbs. Since this herbal mixture is called ‘nanu’, the entire Festival is named Nanumura Mangalle. On the eve of the Nanumura Mangalle takes place another unique event known as ‘abarana paelaendima’, the offering of jewellery to the Bodhi Tree. Underlying this festival is the belief that the Buddha is himself a royal personage- a chakra varti – a world emperor. This festival resembles the Coronation of a king. The Kartika festival is celebrated on the full moon day of the Sinhala month of Il (October – November). It is basically a festival of lights. 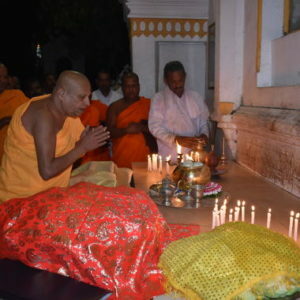 Thousands of clay lamps are lighted and milk rice is offered to the Bodhi tree and Ruwanweliseya.